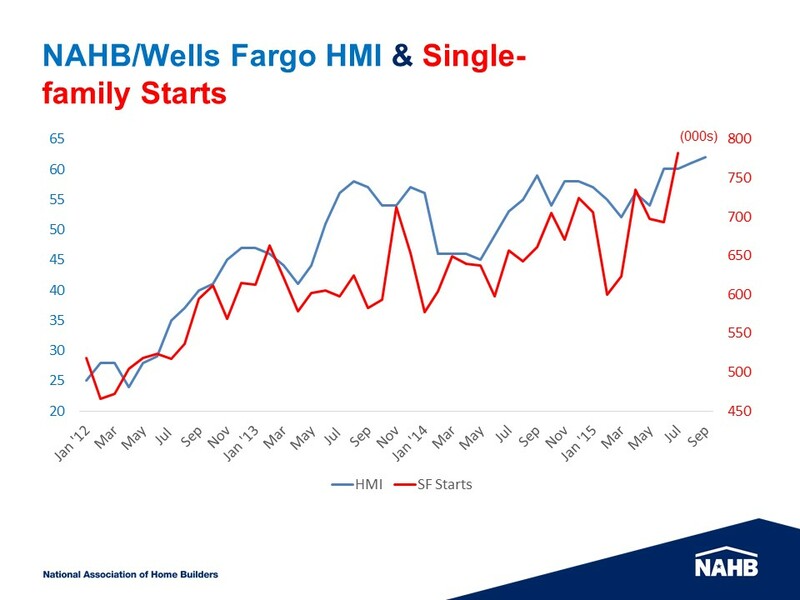 The NAHB/Wells Fargo Housing Market Index for September increased one point to 62, the highest level in 10 years. Two of the three components also increased; the present sales indicator rose one point to 67 and the traffic indicator increased two points to 47. The indicator of future sales declined two points to 68 but from a two-month sustained level of 70 not seen since late 2005. Regional three-month moving averages were up one point in the Midwest (to 59), the South and West (to 64). The Northeast fell one point to 46 but that also was from a yearly high of 47. Builders continue to express confidence that the slow single-family housing recovery will continue, but they are concerned most about their ability to buy lots at affordable prices that enable them to ultimately produce a home that will sell. Lot prices have increased in many markets to the point where the final sales price of the home would not be affordable to prospective buyers or competitive against existing homes. Following the concern about lots were concerns about hiring qualified construction workers and the regulatory regimes that have cropped up to delay construction and raise the cost of the final product. Builders’ confidence increased substantially from the all-time trough of 8 in January 2009 when even small positive movements in consumer interest were greeted with renewed confidence. Since 2012, builders’ confidence has more closely aligned with single-family starts as was the case throughout the history of the index. When the new home builders are going crazy you know something is going well in your real estate market! Lol. In Las Vegas home builders can’t build homes fast enough right now! I love it!